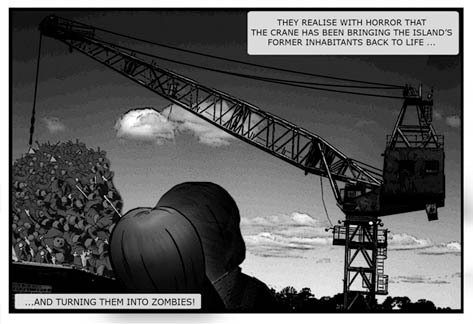 Another noteworthy project from the recently completed Urban Islands design studio down in Sydney was Yael Kaufman's short horror comic book, Cockatoo: Isle of the Dead. 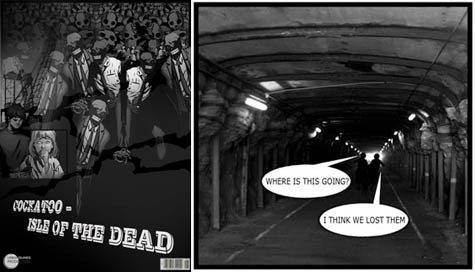 [Image: Scanned & collaged comic book images appear alongside a photo from the Dogleg Tunnel on Cockatoo Island by Yael Kaufman, Urban Islands 2009]. Kaufman's Isle of the Dead tells the story of three friends who have gone out for an evening joyride on a boat in the Sydney Harbor – only to capsize, finding themselves split up, disoriented, and washed by currents onto the dark shores of Cockatoo Island. [Image: From Cockatoo: Isle of the Dead by Yael Kaufman, produced for Urban Islands 2009]. There, two of the them get back together – only to stumble upon an industrial-scale project for the resurrection of the dead. The island's former inhabitants – from prison wardens and ship captains to young reform school boys and girls – are being brought exhumed en masse and back to life by a horrifically repurposed shipbuilding crane. 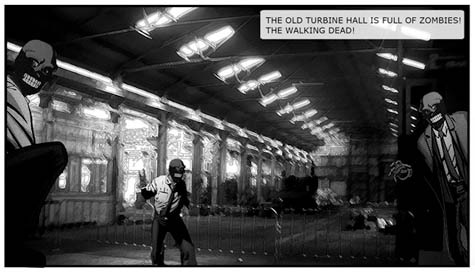 [Image: More collaged comic book images and photos from Cockatoo Island by Yael Kaufman]. Of course, the reason for putting together this sort of project came from the motivating constraints of the studio itself. As mentioned on BLDGBLOG before, the studio's overall conceptual goal was to create 78 playing cards (designed by the students themselves and inspired both by Tarot cards and by Brian Eno's Oblique Strategies deck); each card was based on one of the key sites, structures, events, spaces, and/or personalities from the incredible insular history of Cockatoo. These were then randomly distributed amongst the students, who were required, finally, to produce individual design projects based upon the cards that they had received. Kaufman was dealt The Crane, Tides & Currents, and the island's Former Inhabitants – and so the narrative that she assembled from those elements resulted in the comic book of which we see a few spreads here. During the process of putting it all together, during the extremely limited time frame of only four days in studio, Yael and I looked at House, a wordless graphic novel by Josh Simmons, as well as an English-language version of MetroBasel, a narratively elaborate graphic novel and site analysis produced by Jacques Herzog, Pierre de Meuron, Manuel Herz, and Ying Zhou of ETH Studio Basel. Of course, if I had it with me in Australia, I would also have pointed Yael toward BIG's recent Yes Is More exhibition catalog/comic book. 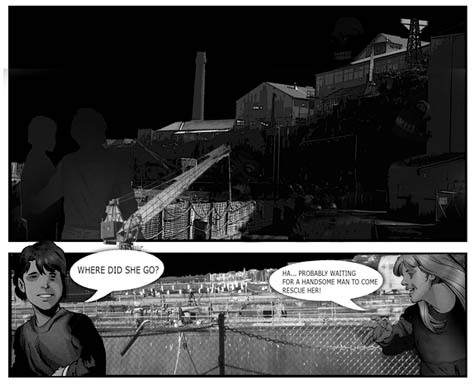 But whether or not you like the idea of using horror stories as a way to explore a given architectural site's history, the graphic novel as an analytic tool is something that deserves greater strategic attention – as well as something that appears quite rapidly to be catching on as a genuine option. After all, if you can open up the range of media – and even, in Yael's case, the range of genres (why not a love story? why not a pop song? why not a murder mystery?) 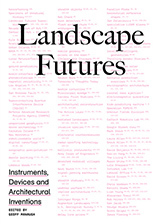 – through which we discuss, argue about, and analyze architecture, then surely the range of participants in architectural conversations will simultaneously expand as well. Put another way: comic books and graphic novels – and, yes, horror stories – are going to be written and produced, whether or not architects play any role whatsoever. 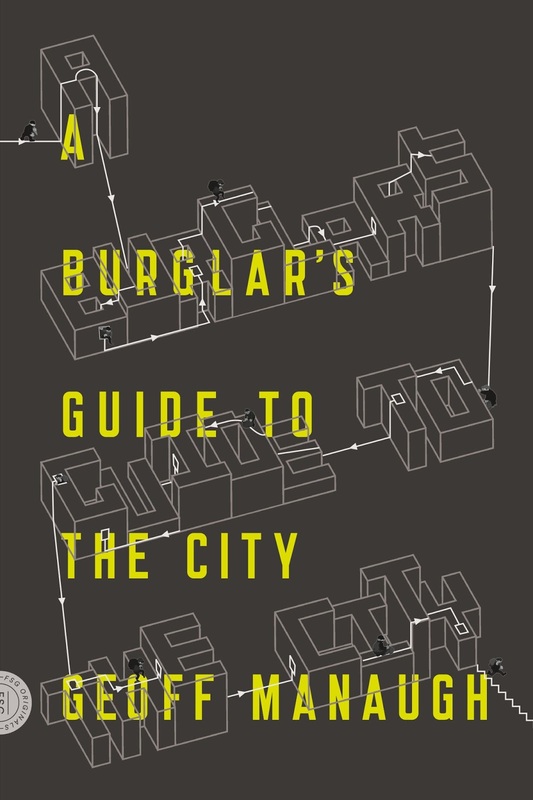 Why not, then, at the very least, slip some interesting ideas and structures into those narratives and help to expand the popular image of what constitutes architectural design? Yes! 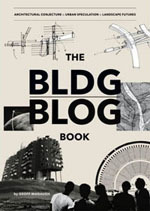 The graphic novel lives in architecture. Wouldn't the Fountainhead or Atlas Shrugged make a great graphic novel?